California’s health insurance exchange, established under the Affordable Care Act, has been held out as a national model for Obamacare. In some ways—not all of them good—it is. Whether it’s falling far short of 2015 enrollment goals or sending out 100,000 inaccurate tax forms, Covered California is struggling with its share of challenges. Now, several senior-level officials integral to the launch of Covered California—who enthusiastically support the Affordable Care Act—are speaking about what they view as gross incompetence and mismanagement involving some of the $1 billion federal tax dollars poured into the state effort. Consultant Aiden Hill became a “foxhole convert” to Obamacare in July of 2010 when he lost his insurance, had a serious medical issue and couldn’t get a new policy. In March 2013, Hill was hired as project manager over Covered California’s massive $120 million call center effort. In just six short months, it would face an avalanche of customers seeking insurance mandated under the new law. 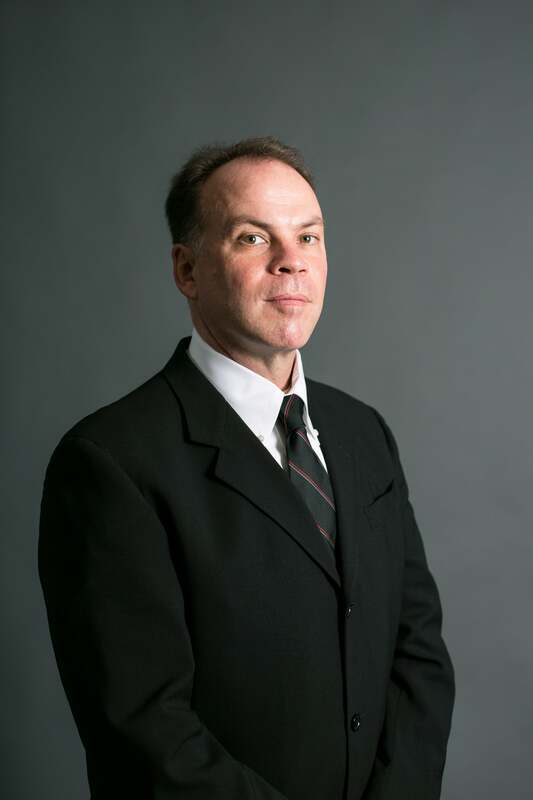 But five months on the job converted Hill from avid supporter to disenchanted whistleblower. He says the secretive and dysfunctional culture was more interested in cheerleading than real results. After he persistently raised concerns, Covered California abruptly terminated his contract. He says the experience drove him to raise allegations about waste and cover ups at a Covered California board meeting. Covered California quietly launched an independent investigation into Hill’s grievances. Nine months later, the results were summarized in four sentences stating that evidence did “not support” Hill’s complaints. Hill calls the probe a sham and says the inquiry didn’t include interviews with many witnesses he suggested. Today, Hill describes himself as disgusted by the process—and soured on Obamacare. “I really believe that we’ve created a monster—and it’s an unaccountable monster,” Hill told The Daily Signal. Covered California declined comment on Hill’s allegations. Other officials integral to Covered California’s efforts concur with Hill’s assessment. 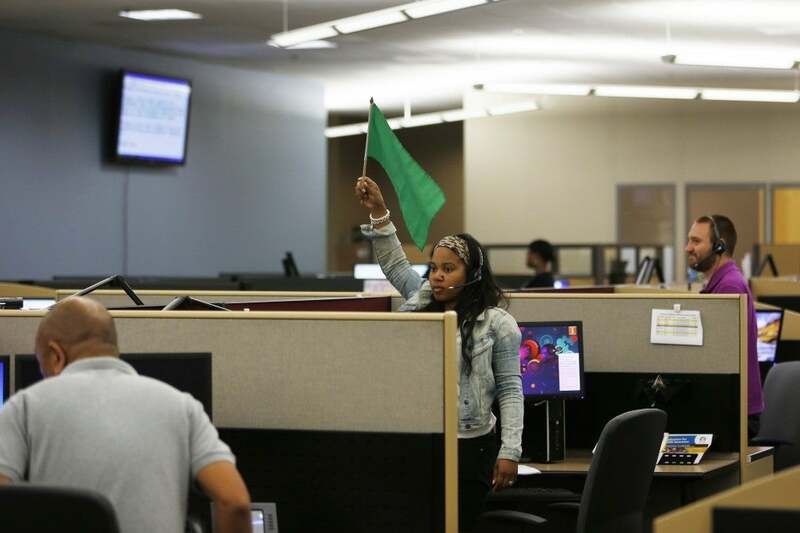 One of them headed the largest call center. 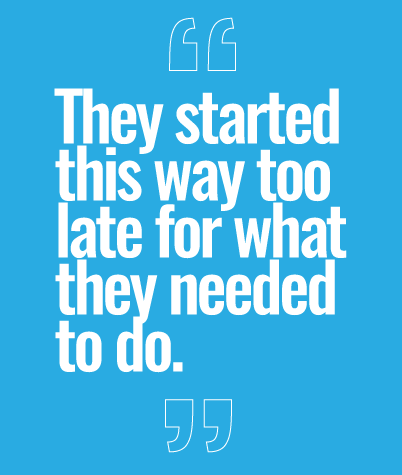 “They started this way too late for what they needed to do,” says the official who was hired in April 2013, five months before the website’s launch. He has since left that position and asked not to be named to protect his current job status. It’s against that backdrop that Covered California finds itself now grappling with a big disappointment: low enrollment growth. California ranked near the bottom in overall growth, with a scant 1 percent increase over last year. 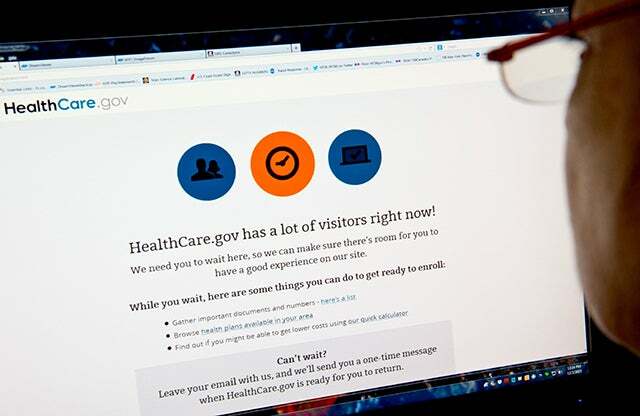 “It’s a tiny fraction of the growth they were expecting,” says an official who helped implement the Affordable Care Act and examined California’s numbers. 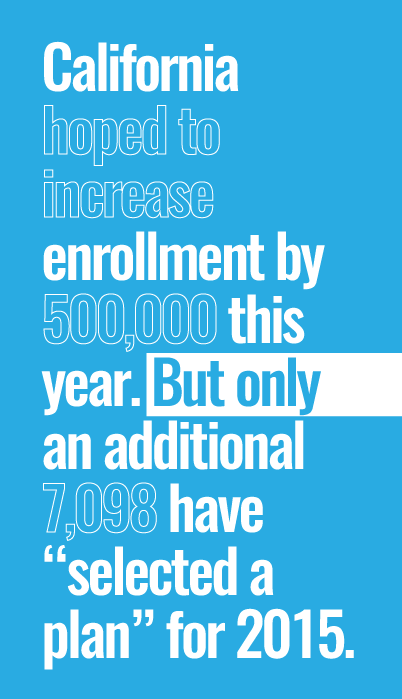 As recently as last fall, the official says, California hoped to increase enrollment by 500,000 this year. But only an additional 7,098 have “selected a plan” for 2015. Covered California would not answer our questions about enrollment figures. Another telling statistic is Covered California’s poor retention rate. Even though people are required by law to have health insurance, only 65 percent of Covered California’s 2014 customers reenrolled in 2015. The rest dropped off. Covered California would not address our questions about lackluster retention and growth. Last month, the agency issued a press release touting a younger and more diverse mix of customers. 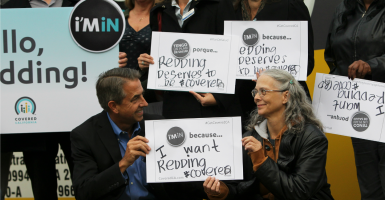 “New enrollment for 2015 coverage is strong and has brought in consumers who our marketing and outreach targeted,” said Covered California Executive Director Peter Lee, overlooking the fact that his organization’s retention of last year’s customers was among the lowest in the country. Hoping for a bump, California followed the lead of the federal HealthCare.gov effort and repeatedly extended this year’s enrollment deadline. The Feb. 15 cutoff was pushed back to Feb. 20 and then Feb. 22. Now, it’s been extended to the end of this month. The devastating crash of Covered California’s website and call centers on Oct. 1, 2013 was “the canary in the coalmine, an early warning of deep dysfunction,” according to Hill. The HealthCare.gov website was on a parallel trajectory. It, too, suffered under hasty development and failed performance tests days before launch—all while the Obama administration put on a positive public face. The meltdown lasted for months and fixes proved costly. Covered California would not provide a tally of expenses, but the agency ended up asking the federal government for an extra $155 million. 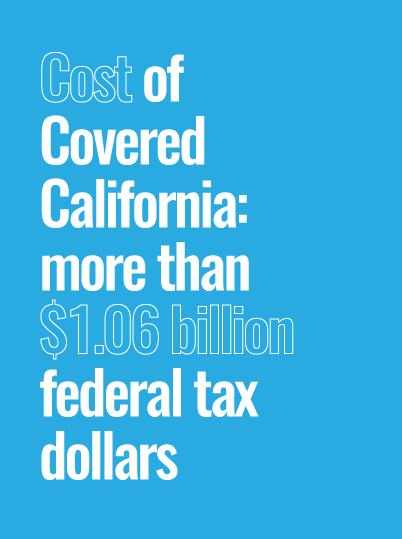 That put the cost of Covered California at more than $1.06 billion federal tax dollars. Covered California’s disastrous debut triggered a house of cards. When the website crashed, consumers were directed to fill out paper applications; they were 33 pages long and took at least an hour to complete. What’s more, they couldn’t be coordinated with the electronic version because of a major design flaw. The forms didn’t match. For example, Covered California’s Lee publicly touted 30,000 successful enrollments for the first month. Hill says the actual number was closer to 4,000. “A lot of the information that came out of Covered California was misleading or outright lies,” Hill insists. Another Covered California official agrees. The Daily Signal asked for Lee’s side of the story, but Covered California declined to make him available. Hill says misinformation was aided and abetted by an uninformed press. In the midst of Covered California’s fiasco, he was stunned to read a New York Times article claiming the Golden State was an Obamacare utopia: the crown jewel of the health care reform effort. What would happen if we unveiled a program that looked like Obamacare, in a place that looked like America, but with competent project management that produced a working website? Well, your wish is granted. Ladies and gentlemen, I give you California. … The California authorities have been especially forthcoming with data tracking the progress of enrollment. And the numbers are increasingly encouraging. That assessment was far from the reality, say the Covered California officials who spoke to The Daily Signal. Covered California is proud that it has been the portal for nearly four million people to find coverage through one of our participating health plans or through low cost/no cost Medi-Cal; is helping more than a million people access financial assistance to lower their monthly health insurance premiums; through the Affordable Care Act has reduced the number of uninsured in California by half. >>> This is the first of two parts in The Daily Signal’s series, “Uncovering Covered California.” In part two, insiders expose Covered California’s “culture of secrecy” and allegations that it promoted egregious waste of taxpayer dollars.